This article is intended for advanced users only. For most purposes, the HAT functionality can be accessed through the Opsoro API. 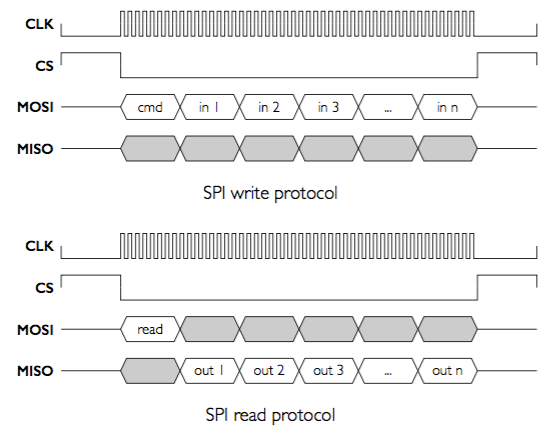 The Raspberry Pi communicates with the microcontroller on the OpsoroHAT via the SPI bus. The SPI bus clock speed is set to a frequency of 122 kHz, this is the maximum bus speed that the microcontroller can handle reliably. A typical transaction between master (Raspberry Pi) and slave (OpsoroHAT) happens in two phases. The first step is to transfer a command plus its parameters (if any) to the slave. Whenever the CS pin is pulled low by the master, the slave will interpret the next MOSI byte as a command byte, with each consecutive byte stored in buffer as parameter data. When the CS pin is driven to a logic high, the microcontroller processes and executes the command, during which the master waits. Results of commands, if any, are stored in an outgoing buffer. The second step is to read the output of the command. This step is optional and only occurs if the master is expecting return data. The CS pin is pulled to logic low and a special CMD_READ byte is transferred to the slave. Each subsequent byte sent by the master causes the slave to return the next byte of the outgoing buffer.